Earlier this week we announced a new feature we’ve been working on for a few months now – Buzz! The idea came about very early after launching Hively when customers stated requesting the ability for team members (employees) to give feedback to each other. One of the key requirements requested with this feature was to have this internal feedback be separate from customer feedback. Employees giving each other feedback is a great way to keep your team members motivated and get insight into how your team is working together. So we’re happy to announce that all of this is now possible in Hively with the new Buzz feature! Buzzes are a simple way for team members to give each other feedback. Think of it like a ‘thanks’ or a ‘pat on the back.’ Team members can give each other a Buzz or receive them from team leaders. What are some reasons to give someone a Buzz? Taking the time to thank another team member can be a great way to keep a positive environment at work. You never know when someone could use some extra encouragement or motivation, and a quick thank you (in the form of a Buzz) might just do the trick! How do you send a Buzz in Hively? Sending a Buzz in Hively is easy. We’ve placed a big orange button in the top menu bar that says ‘Send Buzz’. Simply click this button and a modal window will open. Select the team member you want to send a Buzz to and include a message. Click send and just like with Hively customer feedback, the Buzz recipient will instantly be notified. 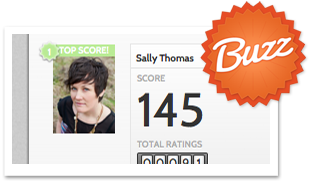 They will also have the Buzz badge prominently displayed on their leaderboard profile for your whole team to see. With each new Buzz received a +1 count will be displayed. Buzz are separated from customer feedback and don’t effect your customer happiness scores. You can see each Buzz you’ve sent in the Send Buzz modal window. By clicking on a previously sent Buzz it will populate the Team Member and message areas with the same content. This will allow you to send the same Buzz to the same person or you can edit it as needed and send again, or to another person. Team members are able to send one Buzz per week. This is to ensure that Buzzes retain their value and not something that becomes common place. That said, team leaders have the ability to send unlimited amounts of Buzz. This way they can use the feature to consistently reward and motivate all of their team members as needed. We’re very interested in how your team is using Buzz so let us know. Here’s to making happy teams!